Teacher Leaders: Join Ambassador Leaders Alumni Network. We know our teacher leaders and students form indelible bonds during the week they spend together during the summits, and many stay in touch through the years using informal channels and social media. Now, Ambassador Leaders is launching an official alumni network on LinkedIn to make it easier for teacher leaders and students to stay connected. We’re thrilled to introduce Ambassador Leaders Alumni Network—ALAN for short. To succeed, we need your help! Join the Ambassador Leaders team by adding your experience as an Ambassador Leaders Teacher Leader to your LinkedIn profile. Just follow the simple steps below to get started today. Many of you already have LinkedIn profiles. If you do, skip down to the next step. 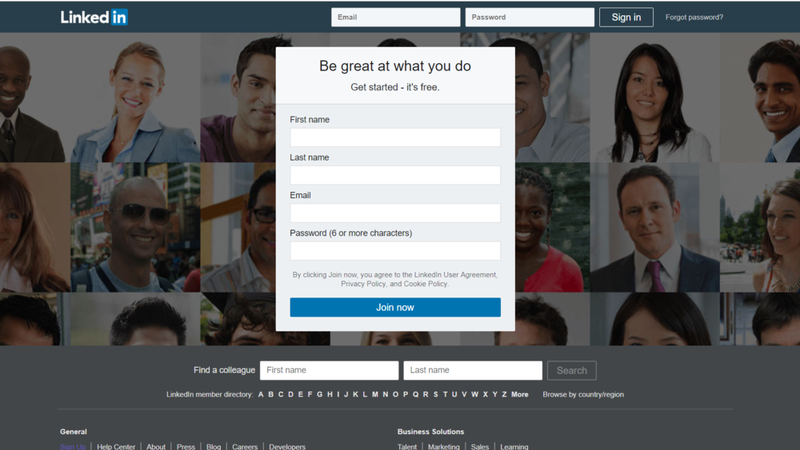 If you don’t, visit LinkedIn, enter some basic personal information and—voila!—you’ll have set up your own account. Once you’ve set up an account, add your Ambassador Leaders experience by clicking the ‘Add profile section’ button on your page and selecting ‘Work experience.’ You can copy the description we’ve provided below to get started and tailor it to capture your unique experience. Description: Ambassador Leaders is dedicated to inspiring the next generation of global leaders. Hosted on campuses of top universities, Ambassador Leadership Summits bring together motivated middle and high school students from across the United States and around the world to develop leadership skills, build confidence, and gain an advantage for college and careers in a global setting. Depending on how detailed your other professional experience entries are, you may add additional details below. Customize it to reflect your unique experience. Completed professional development and safety training prior to a week-long student leadership summit. Led a team of 10-12 student leaders through daily program activities ensuring student safety, timeliness and preparedness. Facilitated rigorous curriculum and student discussions. Guided my group in the creation of a Community Action Plan or patient case study. Mediated student behavior issues by modeling leadership skills and appropriate conflict resolution. Now that you have a profile with your Ambassador Leaders work experience, you can find and connect with other teacher leaders and student alumni. Simply search for Ambassador Leaders and click on our logo in the drop-down menu. At the top of our page, you can search teacher leaders and staff by clicking on the employee link, and search student alumni by selecting the ‘Alumni’ button from the left-hand menu options. That’s it! By following these three simple steps you can take part in Ambassador Leaders official alumni network. Connect with fellow teacher leaders and former students as they grow their own careers, expand your professional network, and extend the remarkable work you do each summer on program.